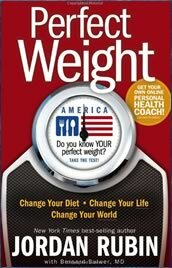 Perfect Weight America was written by Jordan Rubin, author of the New York Times best seller The Maker’s Diet and host of the Christian-based television show “Extraordinary Health”. The diet aspect of the program focuses on increasing your intake of fresh, organic seasonal foods that are free of pesticides, hormones or preservatives. For the initial stage of Perfect Weight America you will eat a diet that consists of fresh fruit, vegetables, nuts, seeds, omega 3 eggs, protein shakes, fish, free-range organic poultry and grass-fed meat. You will consume three main meals and two snacks each day. Following this you move into what Jordan Rubin calls the “Perfect Cleanse”, a detox diet that lasts for ten days. If you are doing the program in summer your cleanse will consist largely of fresh fruits with large raw salads. In the spring and fall you eat a combination of raw and cooked foods. In the winter you will consume soups all day. During the cleansing phase you eat five times a day, consuming a meal every two to three hours. As you progress through the Perfect Weight America you will follow a similar meal schedule, while gradually increasing the variety in the diet. A variety of nutritional supplements are recommended including Jordan Rubin’s brand of protein bars and shakes. The entire program takes a holistic approach by addressing body, mind, emotions and spirit. To support this goal Rubin outlines an exercise involving breathing and meditation to help reduce stress. Jordan Rubin’s website enables dieters to sign up for free access to the online program for the first year. The program features a weekly meal planner, customized portion controls, shopping lists, daily journal, email reminders, online forum and videos. Fruit, vegetables, omega 3 eggs, goat cheese, free-range chicken and turkey, grass-fed organic beef and lamb, red snapper, mahi mahi, salmon, yogurt, almond butter, pumpkin seeds, Perfect Meal protein shakes, avocado, quinoa, millet, lentils, tempeh, coconut oil, olive oil. Perfect Weight America recommends an exercise program, which includes short, intense spurts of activity. Jordan Rubin’s website provides videos demonstrating various exercises. Perfect Weight America retails at $24.99. The recommended supplements, protein shakes and protein bars will also involve additional expense. Also available is the Perfect Weight America Journal for $9.99. Customized program to suit the needs of the individual. Concentrates more on health rather than simply losing weight. Encourages the intake of a variety of organic, seasonal fruit and vegetables. Jordan Rubin’s website features a variety of additional resources. Includes a customized meal plan with shopping lists and recipes. Online meal planner is easy to use. Requires elimination of a variety of foods such as rice, pasta, bread and sweets. May require extra time to be spent on food preparation. Dieters may experience uncomfortable symptoms such as headaches and fatigue during the cleansing phase of Perfect Weight America. Organic foods may be more expensive. Advertises the use of supplements from Jordan Rubin’s product line. Nutritional products will increase the expense of following this program. Perfect Weight America is a holistic 16-week weight loss plan that is designed to help you to achieve your perfect weight by improving your nutritional intake and balancing your life. It will appeal to dieters who prefer to follow a structured meal plan and are interested in creating a healthy lifestyle.